According to a report by Grand View Research, Inc., automobile aftermarket industry is evolving fast and is expected to reach more than $486 billion by 2025. It is found that the trend of customer intention to buy auto parts online, doubled, in a span of 3 years. In addition, according to Pixel Produtions, Inc., there are 70 million auto parts (aftermarket) searches every month on Google. While it is a lucrative proposition, after-sales market is tricky for many reasons. While everyone uses cars, most of them do not repair their own car. Although there is a slight growth in DIY enthusiasts, these numbers still amount to only a fraction. Most of the aftermarket parts are purchased by servicing stations in most markets around the world. Hence, the aftermarket sales are largely a B2B market. 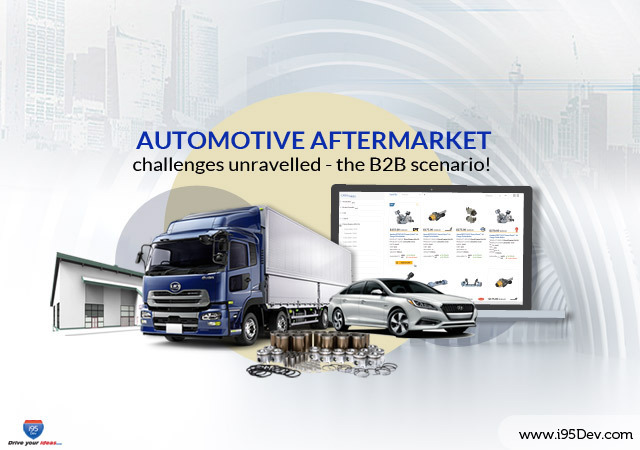 In this blog, we try to look at some key challenges of automobile aftermarket ecommerce and role of a partner in its success. Inventory woes – There are numerous players in the industry across the world who produced various models, with a few of these models in production for more than a decade. To serve such an industry, the aftermarket industry handles a large variety of parts in different sizes. This can be an inventory management nightmare. Automobile aftermarket ecommerce players need serious solutions that handle these challenges. Shipping is critical – Atleast for larger auto parts, shipping is tedious and challenging. Not all shipping operators are suitable for such needs. When dealing with larger auto parts, this information should be tracked real time and made available to the end customers. To achieve this, ecommerce players needs an integrated eco-system to bring together disparate systems. Without such a facility, customer experience is bound to take a hit. Upselling to customers – Upsell and cross-sell generates a lot of revenue. However, not all ecommerce players have the necessary setup to achieve this. Most offline store generate good amount of revenue from this by recommending parts that fetch them better margins. Replicating this means having a good ecommerce setup in place to manage the information in real time. Handling custom orders – Most B2B ecommerce business must offer certain amount of customization and automobile after parts market is no exception. The workflow needed to handle the custom requests is quite different from a standard request and is unique to each business. Platforms like Magento (Read our blog on why Magento 2 is good for B2B) have evolved to deliver most B2B feature that lacked in their predecessors. However, companies generally have critical and specific needs. Finding all those features in a single platform is rarity and a partner like i95Dev fits perfectly in such a scenario. We helped numerous companies build custom solution to suit their specific business needs and enhance customer experience. Let us look at how a growth partner like us can help and build custom solutions for the above discussed challenges. While Magento can work with many inventory management platforms, not all custom workflows are supported. A typical automobile aftermarket parts store has large set of SKUs which is bound to grow perpetually. One solution for this is to provide a blow up diagram that can help navigate the product SKUs. To have this feature on your ecommerce store, you will need to pull the details of the parts the customer is looking at on real time basis and populate the same. A tight ERP ecommerce integration is a must for this scenario. If inventory management is your key problem, read our blog. Custom shipping information needs – Larger inventory are inevitable and must be handled by specialized shipping companies. This information generally resides on ERP. By making this information available to the end user, the customer will stay informed on the status of the delivery. This also allows you to send automated messages when the delivery is going to be early or late. Upselling and cross selling can help enhance revenues. However, these features need real-time information from ERP on inventory status, available price discounts, compatibility with the product in the cart, etc. These details can be easily populated with a connector like i95Dev’s Dynamics line of products. With minimal customizations, specific requirements (like populating products available in the same warehouse as the product in the cart) can also be met. Custom requirements are common in any B2B scenario and automobile industry is no exception. Such scenarios need effective information management right from capturing the requirement to shipping the same. With a major amount of the operational data flowing from ERP, Magento ERP integration is vital in such a case. All the above scenarios are based on our experience helping various ecommerce player over the period of more than 17 years. We help ecommerce players across the world build connected ecommerce eco-system. Our expertise spans over multiple ERPs including MS Dynamics GP, NAV, AX, 365, SAGE 100 and SAP B1. We work with leading solution provides in the ecommerce ecosystem to add value to our customers. For more information on how we can help you, please contact us on info@i95dev.com.